I’m happy to announce this minor bugfix release of gqrx. 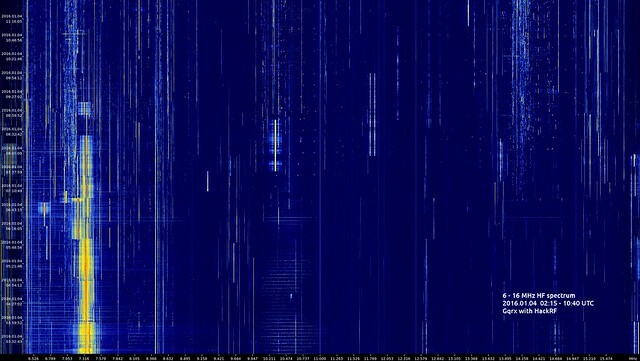 Gqrx 2.11.1 has been released and is now available for download. 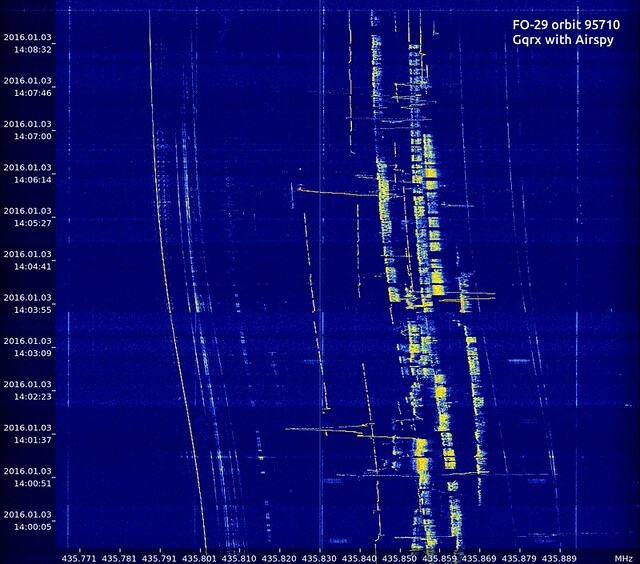 Someone has pointed out to me that it’s been almost a year since gqrx 2.2.0 was released. There have been a few snapshot releases since 2.2.0 and some of them got even included in distributions. However, considering the large number of improvements and bug fixes since 2.2.0 I felt it was appropriate to tag a new release. Support for setting analog bandwidth. Support for setting gain stages individually. Remember visibility status of main toolbar. Restore the geometry of the main window between sessions. Restore the state and placement of the dock windows. 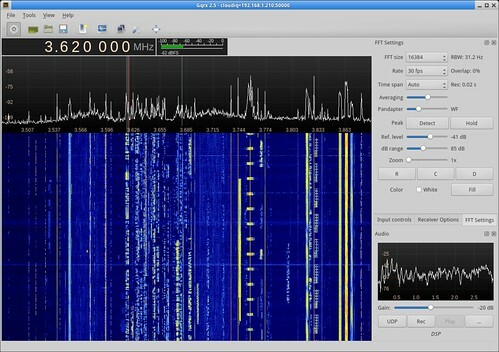 RF Space SDR-IQ, SDR-IP and Netsdr support. Peak detection on the FFT plot. Max hold on the FFT plot. Audio streaming over UDP socket. Remote control through TCP socket. Set squelch level from current signal/noise level. Command line option to list existing configurations. Incorrect handling of decimal values in LNB LO frequency. Correctly apply initial LNB LO frequency. Audio output device selection on Mac OS X. Properly store settings when using Save As function. Crash when recording audio with no rec directory set. Only allow audio playback while DSP is running. Ensure DSP is stopped when we exit. Freeze when switching modes after audio recording. Toggling “ignore limits” changes frequency. Rename scope.svg to gqrx.svg to avoid confusion. 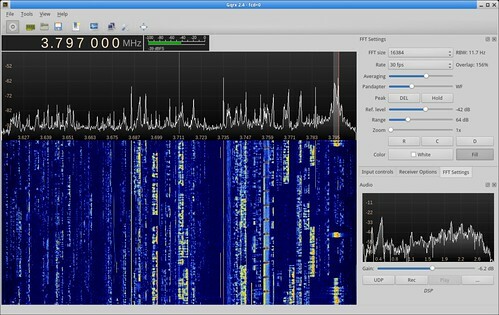 Gqrx can fit on small screens (900×600 pixels). Better color gradient for the waterfall. FFT presentation at high rates and high sizes. Make release news available through the Help menu. Many of these changes are contributed by others as can be seen in the list of contributors. The source code is available through Github or Sourceforge. Ubuntu packages for Trusty and Utopic are in the PPA. Mac version is expected to be available through Macports soon. This is probably the last version I am going to release for a very long time, perhaps ever, as I neither have the time nor the interest to continue down this road. Hopefully we can find somebody else to take over further development and maintenance. Just a quick note that we have got armhf builds enabled for our gqrx/snapshots repository. Armhf refers to ARM architecture with hardware floating point support. For now I have rebuilt all packages for Ubuntu 12.04 as this seems to be most common Ubuntu used on ARM devices. Later I will also rebuild for Ubuntu 13.04 but there are limits on how much resources one can use when building for armhf and I have to watch out not to abuse this service. I can imagine that gqrx may not be very useful on all arm devices; however, I hope that at least the driver libraries, the command line tools and maybe even gnuradio itself will be useful. After nearly one year of development since the last official release, we are now finally ready with Gqrx 2.2. Amongst the new features and bug fixes, this release brings support for the HackRF Jawbreaker and the Funcube Dongle Pro+. See supported hardware for a complete list of devices that are known to work with Gqrx. I have made a video recording of my first tests using Gqrx and the Funcube Dongle Pro+. One of the biggest challenges with Gqrx has always been installation difficulties caused by the endless list of dependencies. To address this issue we are now officially packaging Gqrx for Ubuntu Linux and for Mac OS X, both distributions including all the dependencies that are not commonly available for that platform. In the case of Ubuntu Linux this has resulted in a complete GNU Radio package with the full SDK, including awesome tools such as the gnuradio-companion. The app bundle for Mac OS X does not contain the full GNU Radio SDK; however, it does include various command line utilities that come with the hardware driver packages (rtl_test, hackrf_info, uhd_find_devices, etc). Although it is probably possible to subscribe to both channels there is probably no reason to do so. All packages in gqrx/releases are also made available through gqrx/snapshots. A list of changes since the previous releases is available in the news.txt file. 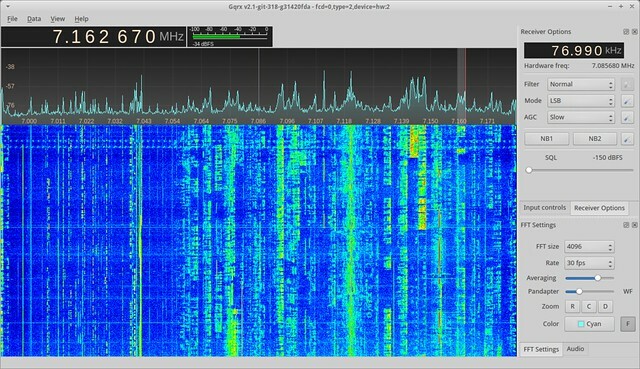 Head on to download page and get gqrx 2.2 now! See Github for a list of known bugs. Feel free to report any new ones that you may encounter.